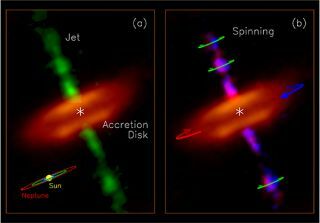 Observations from the ALMA telescope in Chile revealed spinning jets of material (green) ejecting from inside the accretion disk around a young star, which ALMA could picture at a resolution of 8 astronomical units. A model of the solar system is included in the lower left for scale. Astronomers have observed the eating habits of a newborn star — and like any youngster, it has an affinity for fast food. Using the powerful Atacama Large Millimeter/submillimeter Array (ALMA) in Chile, an international team of researchers has imaged the flow of material around a "young" 40,000-year-old protostar called Herbig-Haro 212 (or HH 212), located some 1,300 light-years away in the constellation Orion. A protostar is the earliest stage of star evolution, just before the star begins nuclear fusion in its core. Protostars are known to generate powerful jets of gas that blast into interstellar space and this work reveals that HH 212’s jets are spinning, with the material blasting out from the protostar's poles like bullets. HH 212's accretion disk is nearly edge-on from our perspective on Earth and has a radius of 60 astronomical units (AU), where 1 AU is the average distance at which the Earth orbits the sun — about 93 million miles (150 million kilometers). The disk has a "prominent equatorial dark lane sandwiched between two brighter features," the researchers said in a statement, giving it a resemblance to a hamburger. The discovery of HH 212's rotating jets was made around the same time as another team was using ALMA to clock the angular momentum of rotating jets blasting from Orion KL Source I in the Orion Nebula, another protostar. This 3D cartoon shows how a spinning jet flies out from the accretion desk feeding a central protostar. The second panel shows a zoomed-in view of the center. "We see jets coming out from most baby stars, like a train of bullets speeding down along the rotational axis of the accretion disks. We always wonder what their role is," lead astronomer Chin-Fei Lee, of the Academia Sinica Institute of Astronomy and Astrophysics (ASIAA) in Taiwan, said in a statement. "Are they spinning, as expected in current models of jet launching? However, since the jets are very narrow and their spinning motion is very small, we had not been able to confirm their spinning motion. "Now, using the ALMA, with its unprecedented combination of spatial and velocity resolutions, we not only resolve a jet near a protostar down to 10 astronomical units (AU) but also detect its spinning motion," Lee added. "It looks like a baby star spits a spinning bullet each time it takes a bite of a space hamburger." An illustration of the movement of material around the protostar and out through spinning jets. As they form, protostars feed off their spinning accretion disks, but a problem with stellar-formation models has been that these disks of gas are predicted to spin too fast, preventing material from falling into the star. Now, scientists have confirmed that these spinning jets blasting from protostars are removing angular momentum from the system, slowing the accretion disk spin and allowing the protostars to feed on their "space hamburgers," the researchers said. To imagine how angular (or rotational) momentum is removed from an accretion disk, think of a hammer thrower spinning on the spot. The athlete and hammer increase their angular momentum as they spin faster. Then, as the hammer is released, this angular momentum is converted into linear momentum — providing the energy to launch the hammer into the air and across the field. The spinning athlete comes to an abrupt stop as most of his rotational momentum has been removed by the hammer. In the case of the spinning protostar's accretion disk, as the jets are launched from the poles and along magnetic field lines, they too remove rotational momentum from the system, effectively slowing the disk down. Astronomers previously observed the star at a resolution of 140 AU, meaning astronomers couldn't see the protostellar jet rotation. But using the ALMA's awesome power, Lee's team could probe the system at a stunning resolution of 8 AU — about 17 times higher than previous efforts could. With these new observations, scientists can see the spinning jets very close to the central protostar, confirming theoretical models of spinning jets being launched from the innermost disk, slowing the disk’s rotation and allowing the protostar to feed off its "space hamburger." Follow Ian O'Neill @astroengine and http://www.astroengine.com. Follow us @Spacedotcom, Facebook and Google+. Originally published on Space.com.